Rick Brannan from Logos recently posted a very helpful article on the differences between the Nestle-Aland27 (NA27) and the United Bible Society 4th Ed. (UBS4) Greek New Testament texts. As he points out, the Greek texts are essentially the same, but there are differences in punctuation, casing, spelling, and formatting. 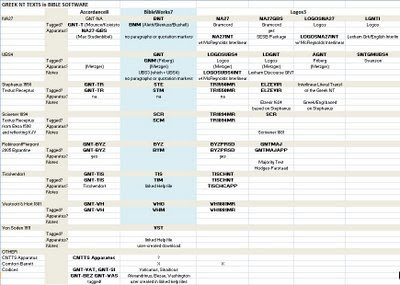 With his post as an impetus, I pulled together a quick spreadsheet showing how NA27 and UBS4 are implemented in Accordance, BibleWorks, and Logos. Since BW7 does not provide paragraph formatting, one of the main differences between and NA27 and UBS4 is obscured. The BNM/T version is based on the NA27 punctuation and the GNM/T on the UBS4, so one can detect those differences. In addition to NA27/UBS4, there are quite a few other Greek NT texts available. I have included them in my table. Note that the Stephanus text of 1550 was the basis for the Beza text of 1598 that was the text used for the KJV. Scrivener in 1894 used the Beza text and modified it to more closely match what must have been the underlying Greek text used by the KJV translators. The Stephanus and Scrivener texts are both representatives of what is called the Textus Receptus. The Robinson-Pierpont text, updated by Robinson in 2005, presents the so-called Majority Text which reflects the Greek text which is supported by the majority of ancient manuscripts. (There is a separate and different Majority Text presented by Hodges-Farstaad, a text available only in Logos.) Critical editions of eclectic texts (which also describes the NA27 and UBS4) are presented by Tischendorf and by Westcott and Hort. In my table, users of each of the Bible software programs may most appreciate the abbreviations which I highlight in bold. Especially for BW7 and Logos, typing the abbreviations in the command line or Go box will call up that particular text. The basic BW7 package comes with all the texts listed (except for the von Soden; cf. below). For Accordance and Logos, the texts you get depend on the package you buy, but you can add on the modules individually. Note that BW7 handles the morphological coding of the texts somewhat differently than Accordance and Logos. In BW7, the text and its morphological coding are two separate but closely linked files, hence two separate texts are indicated. In Accordance and Logos, the text and its coding are embedded together. There are many other ways to deal with text critical issues, however. Metzger's Commentary on the Greek NT is available for each. Tischendorf's apparatus is also available for each as well. The NET Bible also provides extensive text critical notes. The CNTTS NT Critical Apparatus is the attempt to provide the most comprehensive view of the Greek manuscript texts. Though not entirely complete yet, it is available for Accordance (and also for BW7?). Nothing beats looking directly at the texts of individual manuscripts. Accordance has modules for Vaticanus, Sinaiticus, Bezae, and Washington. 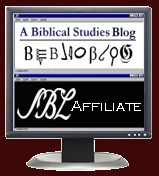 BW7 has user-created databases for Vaticanus, Sinaiticus, Alexandrinus, Bezae, and Washington hosted on the BW blog. Another great resource for textual criticism that includes Greek texts of the 69 earliest Greek papyrii is Comfort and Barrett's The Text of the Earliest New Testament Greek Manuscripts. It is available in Logos (without photographs, however) and BW7. If I've missed anything, please pass along corrections to me. So, here is the XLS file if you have or can read Excel files, and here is a PDF version or you can click on the graphic at the top of this blog post. UPDATE: 2008.07.10: Phil Gons from Logos just posted about textual apparatuses available in Logos. He also points to this very helpful article, "Critical Apparatuses: What and Why." In Accordance, GNT-T does *not* use Gramcord morphology; it’s a different tagging by Bill Mounce and Rex Koivisto. The older module, GNT, *did* use Gramcord, but there was apparently a dispute between the Gramcord Institute and the Accordance folks regarding licensing (I assume that the dispute was spelled: $). The last version of the GNT module in Accordance used NT27, 2d printing, 1994 and the last Gramcord morpholgy used by Accordance was v. 3.6 (2001). The current GNT-T text is NA27, 1993 and the Mounce/Koivisto tagging is v. 3.5 (2007). Thanks, Rod. I'll have to fix the files later, but I updated the blog. I am using an older version of Accordance, so that's where I got the Gramcord coding. Thanks again.